A patient warning letter for behaviour is a letter written either by a doctor or a healthcare provider. This letter is addressed to the concerned patient who has shown unacceptable and unprofessional behaviour toward the doctor or the hospital. When a patient is under the treatment, a doctor-patient relationship has to be built up for the effectiveness of the treatment. However, if the patient behaves in an unprofessional way, not only will this relationship suffer but the patient might get terminated from receiving any future treatment. 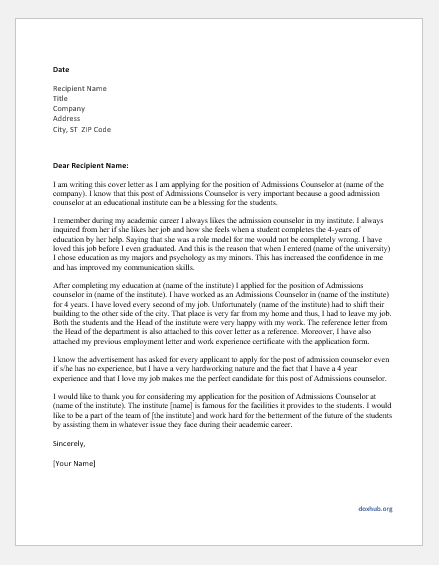 For the unacceptable behavior executed by the patient, a warning letter is usually issued to him before implantation of any serious action. This warning letter is kept in the patient record file for any future reference. If the patient continues his bad behavior, the organization may stop providing the services and treatment to him. This might affect his record and other hospitals may resist making him their patient as well. You have been under the treatment of Dr. Watson in our XYZ hospital for two years now. Although, we do care about your health and well-being but our hospital cannot bear your rude and aggressive behaviour. You have shown your aggressiveness few times before as well and we did not take any action as you were under therapy and psychological treatment. However, as your doctor has informed us that you have an improved condition now, we will not tolerate your unprofessional behavior at all. Our hospital is very strict in giving respect to all our staff and you are often rude and aggressive toward nurses and other helping staff. Even once, your doctor also reported your bad behavior as well. 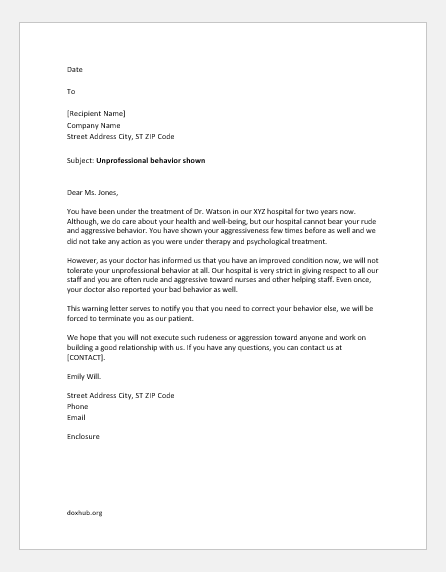 This warning letter serves to notify you that you need to correct your behavior else, we will be forced to terminate you as our patient. We hope that you will not execute such rudeness or aggression toward anyone and work on building a good relationship with us. If you have any questions, you can contact us at [CONTACT]. 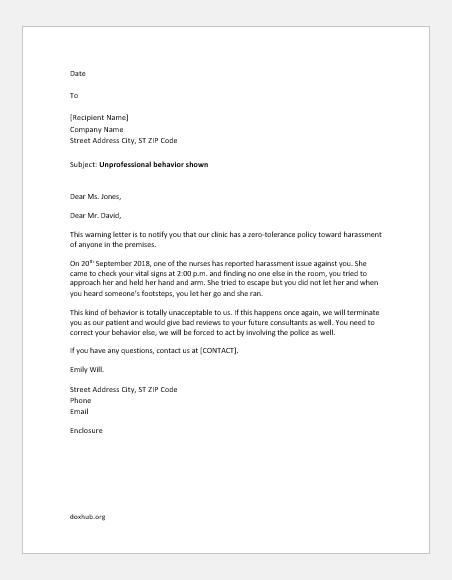 This warning letter is to notify you that our clinic has a zero tolerance policy toward harassment of anyone in the premises. On 20th September 2018, one of the nurses has reported harassment issue against you. She came to check your vital signs at 2:00 p.m. and finding no one else in the room, you tried to approach her and held her hand and arm. She tried to escape but you did not let her and when you heard someone’s footsteps, you let her go and she ran. 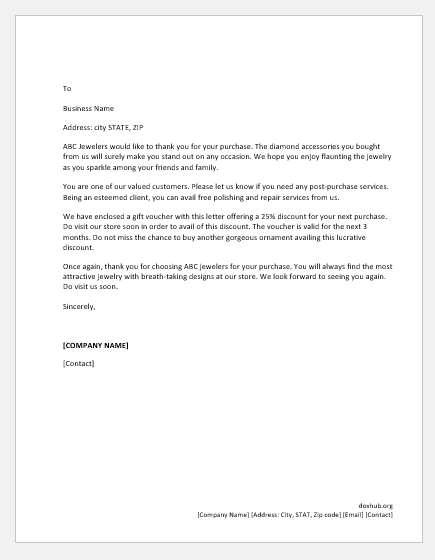 This kind of behavior is totally unacceptable to us. If this happens once again, we will terminate you as our patient and would give bad reviews to your future consultants as well. You need to correct your behavior else, we will be forced to take action by involving the police as well. If you have any questions, contact us at [CONTACT]. This is a warning letter for your misbehavior with Dr. Ali at 3:00 p.m. on 29th October 2018. When the doctor came to check your condition and asked you a few questions, you not only became rude but abused and threatened him and broke his stethoscope and the ultrasound machine. We have a list of questions that he asked and those are all the necessary questions that every patient is asked as their answers are important toward the analysis of a patient’s condition. Your disruptive behavior caused disrespect to our doctor and damaged the hospital’s equipment as well. Our hospital never tolerates such behavior and, in the past, we have often terminated many patients enrolled with us even without giving any warning. 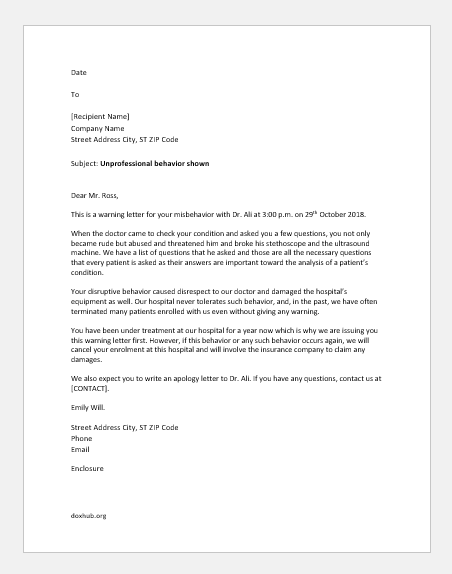 You have been under treatment at our hospital for a year now which is why we are issuing you this warning letter first. 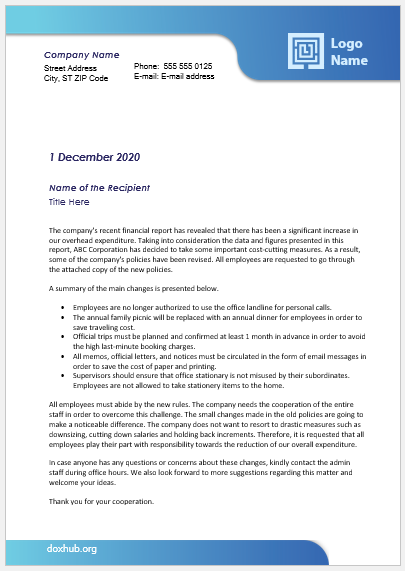 However, if this behavior or any such behavior occurs again, we will cancel your enrolment at this hospital and will involve the insurance company to claim any damages. We also expect you to write an apology letter to Dr. Ali. If you have any questions, contact us at [CONTACT].